Welcome to my Play-Big homepage ! This is not an offical site from big. Big and Play-Big is a registered trade mark from the Big Spielwarenfabrik GmbH & Co KG, Fuerth in Germany. For further informations about PlayBig, you can contact me in english language. The inventor of the Play Big figures was the diploma Ingeneur Ernst A. Bettag. He led the company Big with plastic toys to world fame. 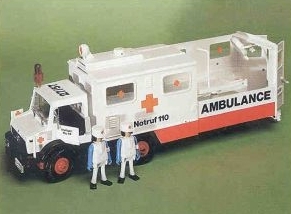 1975 appeared the first PlayBig figures, which were sold world-wide, however particularly in Europe. Remarkable it was also that in Great Britain the figures separate Play Big not under the mark under the name Busy Bodies of Playcraft were driven out. A law case before the german BGH with the company geobra Brandstaetter, which 1974 had appeared already with plastic figures on the market, decided against Big. At the end the BGH, "that PlayBig figures the impression of a self-confident, judged sporty, aggressive man mediates, whereas the Playmobil male had the effect of a child, nicely and still uncertainly on the legs". This led for adjustment production starting from 1978 or 1979. By a fire in the year 1998 in the Big work in Fuerth unfortunately large parts of the existing informations about PlayBig were destroyed. Therefore few information can be only referred directly by the former manufacturer. According to information forms for PlayBig figures and accessories were sold some years ago to South America. In addition details are unfortunately also not well-known however. Compared with other play worlds with PlayBig "material" topics with were also always merged. As example are here the olympic winter and summer games, or the different football crews (e.g. the German, Italian or Swiss team) remarkable. Starting from 1977 then the PlayBig figures of the "generation came 2000" or simply briefly PlayBig 2000 on the market. The figures were revised completely and received curved arms and "articles of clothing" for the belly and back. With the introduction also new topic worlds were created. Here today still particularly the Wikinger is in your different versions well-known. The "old" PlayBig series was partly also changed over and provided with new packings. Although production is past already more than 25 years, PlayBig is still an assembly area for many lovers world-wide. Since no new parts are more manufactured as well known, Internet auction houses or flea markets is often the only source of supply. From time to time on collecting tank's and toy meeting's some PlayBig figure's are still represented. I'm a PlayBig collector and I love it. So I started with this page and made pictures of my private collection. This page is still growing, the other sites are still in german language. They will be translated in the next time. Enjoy it!